Hey guys my dad and I are just about done replacing the cast intake and 2 barrel on my 77 with the Weiand intake and Q jet. We are not quite sure on the routing of a coupe vacuum lines. The major one is to the Vacuum advance, where should it be connected? There is one port that has continuous Vacuum and one other that only has vacuum on high idle/ acceleration.. We are pretty certain that we need to connect it to the high idle/ accel port, but just want to make sure.. Once we get that one I am certain there will be more questions coming. Use the manifold vacuum port. Found this sir. Hope it helps. You cant go by that pic 100% but the main ones are there. Usually the very bottom of the carb are manifold vac. When you get towards the top its ported,usually,not always. Any port on the carb throttle plate and below would be manifold vacuum. Anything above the throttle plate is ported vacuum. Vac advance should go to manifold vacuum unless there was some design change with emissions on your year. Ok, that will get us started..I want to say that we did not take the old carb and manifold off. A friend of my dad's started this for us, then his girlfriend got diagnosed with cancer, so he has been spending a lot of time with her, running her all over for treatments. I am just excited to get it going again. I am turning 16 in a few weeks! One other question about timing, the decal on the core support states 8 degrees of advance, should that be any different with the new intake and carb? 8 is not enough. That was for emissions purposes back then . Put it to 12 and see how it does you might need a little more. There is a ton of information on how to set timing, how to adjust it, how to tailor the timing curve to your engine, etc..
Google is your friend on this subject, and getting a proper timing curve is the single best thing you can do for getting all the power and efficiency your engine is capable of. You can generalize what works for most small block chevy engines. 12 degree initial, 32-36 total, 15-20 vacuum advance, use as quick of an advance as your engine can handle. Every engine is unique, but these ranges should work well for you. Start conservative with the smaller degree numbers and slower advance springs and gradually increase until power/throttle response/fuel economy cease to increase. Dial back timing lights can work for you, or you can install a timing tape on the harmonic balancer and use a standard timing light to check advance degrees. Good luck! I saw an article a while back about ported vacuum versus manifold vacuum. Seems that either ends up about the same when RPM levels off at cruise. As an example, the '59 Pontiac that I bought new, had manifold distributor vacuum from the factory. So I guess that whatever works for you is best is the way to go. Using manifold vacuum for your distributor vacuum advance helps with setting your total timing at idle. Then when you hit the gas, you lose your manifold vacuum, rpms rise and mechanical advance (dist. weights) kicks in. 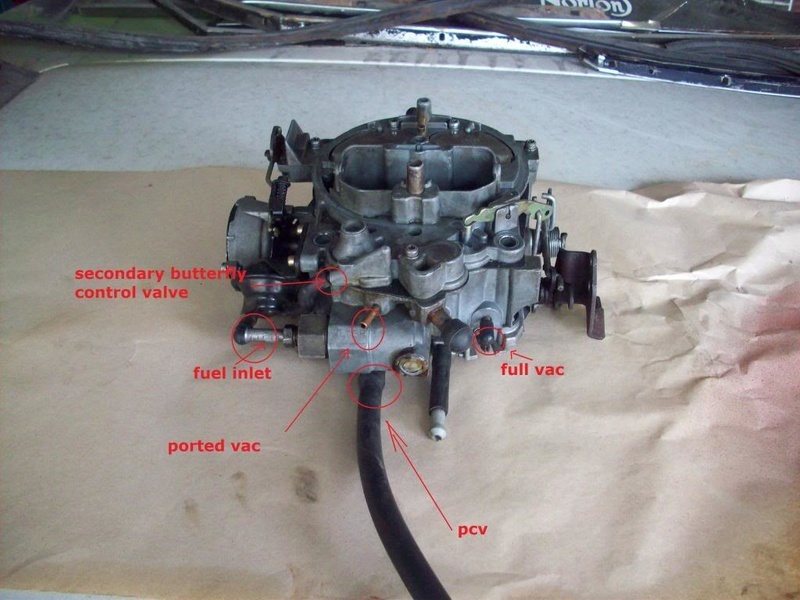 Here's an excellent write up on how to set up your ignition system. Its a long read but well worth it. Setting up your ignition correctly makes a world of difference in the amount of vacuum you have for power brakes. My buddy has 2 small block cars with comp cams 305 duration cams and no vacuum canister.